Guess what we did Friday night? Actually by "we" I mean "me" and five little girls... his gorgeousness missed out on all the fun. the best movies I probably have ever seen, I was totally immersed in it!!! 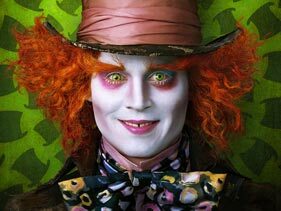 Johnny Depp is Da Bomb!!! His gorgeousness is quietly jealous of my Depp Raving.. i know it. Yesterday was a whirl wind too... we did some long overdue shopping for the house. Spring is on the way!!!! Please God send us Spring!!!!! Happy Sunday y'all... hope you're having a good weekend too!!!! Awesome!! I really want to go see it. Was suppose to go yesterday with my daughter but she saw it with a friend Friday Night! I wasn't planning on seeing that movie, but since you said it's that good, perhaps I'll have to re-think it. have not seen it yet...cant wait. been an incredible chill weekend with the fam here...the pic at end there is amazing. love it. I love that pic! I can't wait for spring. My daffodils are peeking up from the soil but nothing is in bloom yet. That's what I miss about the South. I'll probably see Alice in Wonderland, but maybe in a couple of weeks. I hate to go when it's crowded! Happy Sunday! I want to see the movie too but I don't want to drive to another town to see it. They closed the movie theatre a mile from my house and I'm not happy about it. I'm ready for spring too. I'm so sick of the wet weather. love your magnolias!! isn't the pink just beautiful? i also want to see Alice but my nephews balked at going with mom and the aunt...so i'll wait until next weekend. i can't wait. I have been hearing SO much great stuff about this movie! I MUST go see it soon! Thanks for the reminder! I haven't seen the movie yet, but I'm hearing some good things about it. You are a real trooper taking all those kids. Yes, bring on the spring.